In November of 2017 voters in Hadley, Massachusetts let their voices be heard at the ballot box. 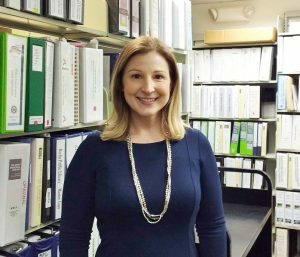 Hadley had made the historic decision to accept nearly four million dollars from the Massachusetts Board of Library Commissioners and to allocate the balance of funds needed to construct a new library. The Goodwin Memorial Library, constructed in 1902, would be replaced with a single story, fully accessible facility with greatly improved parking, collection capacity, and meeting space. Hadley is a community of roughly 5,250 people with a town meeting form of government. Because town meetings are attended by a minority of residents the committee felt that it needed to mobilize between 300 and 500 supporters to deliver the needed two-thirds majority. This would be especially important in case of an organized opposition. The Committee’s Get Out the Vote strategy for both the special town meeting and ballot vote emphasized one-to-one communication between neighbors, particularly those who were likely to support the library. The use of attendance lists from previous Town Meetings was crucial in this process as it identified those who were already likely to attend based on previous behavior. GOTV volunteers attended brief strategy meetings and were each asked to contact ten to twenty residents who were seen as likely to support the library project. Volunteers asked each person contacted whether they would likely attend the special town meeting on the specified date and if the answer was affirmative they were also asked how many others from their household were likely to attend. This effort worked as a running head count, but also as a way to gently remind likely supporters of the town meeting and its relevance to the library project if they were not already aware. Additional efforts included a number of supportive letters to the editor of the local newspaper as well as several press releases that resulted in media coverage of the special town meeting. A small run of lawn signs (underwritten by the Friends of the Library) was distributed to the homes of supporters in the week leading up to special town meeting. The special Town Meeting held on August 29th was attended by nearly 500 residents putting the hall at full capacity. Some twenty to thirty people participated from the hallway which was used for overflow from the main room. Roughly a dozen members of the public spoke articulately and passionately in support of the article from the floor. The final vote was 449 in favor with 28 opposed. The nearly unanimous sea of hands held up to vote “yes” was a powerful affirmation of the importance of the library and the services that it provides to this community. The successful result at Special Town Meeting sent the borrowing question to a town-wide ballot on November 14, 2017. The strategy for the vote was similar to the lead-up to Town Meeting, with the majority of effort going to reactivating those in attendance in August. Additionally, a town-wide mailing was undertaken and paid for by the Friends of the Library. These postcards were mailed to every active postal address in town, rather than targeting supporters only. As in August, lawn signs were created with the slogan “Our Community, Our Library”. Again, the operative assumption was that participation in the ballot vote would represent a minority of Hadley’s total population. To succeed at the ballot a simple majority is needed rather than two-thirds majority. Ultimately 1,157 votes were cast. 683 in favor and 470 opposed (with four left blank). Looking back over a process that began in earnest in the Spring of 2014 when Hadley accepted the MBLC’s Planning & Design Grant I have taken several lessons from our journey so far. Most of these may seem like common sense, but I think they are all worth repeating. Know your community, but don’t buy into all of its conventional wisdom. We have all heard from community members who, claiming to know it very well, believe that it can never change. This is especially true when there are memorable instances from the past where a divisive issue led to a bitter defeat for an important project. Every campaign happens in its own context. In being offered something worth the effort and risk each community has the opportunity to follow a new direction and write a new chapter. And who knows, perhaps the community that we thought we knew so well has changed a bit more than we anticipated. Say, “Yes” as often as it is possible and practical to do so. The early stages of planning are a great time to paint with a broad brush and think big. An important part of building consensus is to hear from the community about what they think should be included in such a transformative project. I was often surprised by how important the functional aspects of the proposed library were to residents who engaged with the planning process. Would we have a green building? Can the Children’s Room be situated so as to contain noise and maximize safety? What about accessing the meeting rooms after hours? These kinds of questions arose far more than those relating to the appearance of the building, for instance. People could see the possibilities in the new library and asked us to consider many suggestions, some more practical than others. As often as we could we said “Yes” in terms of at least considering any idea brought to us. Some of these ideas might not make it into the final plan, but all ideas were considered important enough to merit consideration. And if that “Yes” must ultimately become a “No” there would be a solid rationale to back up the decision. It is amazing what you can learn about yourself or the things you are working on “through the grapevine”. Scuttlebutt is a natural and unavoidable aspect of anything political. Decisions made out in the open will be questioned rigorously, fairly or unfairly, but when the perception is that important decision-making is being made behind closed doors then trouble is sure to follow. A savvy opponent will use any procedural mistakes made by a committee to undermine public confidence and slow down the process. Always follow open meeting law and advertise meetings as widely as possible. Provide information as quickly and completely as possible, even when it is to someone working against your project, as is your obligation. At the end of the day it’s the integrity of the process that matters and those in the community who are objectively on the fence may well be swayed by that integrity to help write a new chapter. 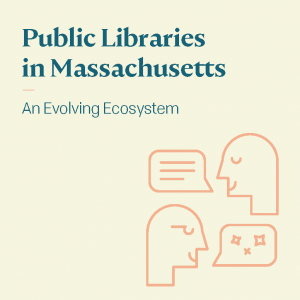 Massachusetts’ web of automated networks, robust delivery service, and state aid funds to public libraries make it easy and convenient for people to use not only their own city/town library but to freely use any public library in the state. And they do! The perennial question in library circles is why? Why do some folks in Massachusetts cross city/town borders for their library fix? As is true with many questions, the answers don’t come easy or fast. 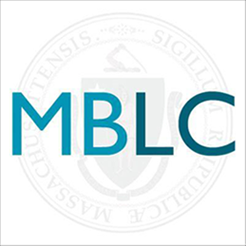 To help figure it out, the MBLC is launching a study of cooperative borrowing and use patterns of Massachusetts public libraries, especially in-person visits by people that live in other cities and towns. In addition to gathering statistical information from our networks and ARIS reports, between July and September we are seeking input from library users and library staff members through our Your Voice, Your Library survey. For some people, surveys are at worse The Plague and at best a nuisance, so we are sweetening the deal for even the most reluctant survey taker. During the month of August, patrons completing the Your Voice, Your Library survey get a chance to enter to win one of three Apple iPad Pros. Not bad, right? As the patron survey closes, we launch a separate survey of library staff in September. As an incentive to complete it, staff members get a chance to win a “seat on the bus” on our exclusive Your Voice, Your Library tour. We will take a small group of library staffers to as many new library buildings that we can cram into one day (dates and libraries TBD). There will be two different tours offered on two different days for up to ten people on each tour. We’ll talk about what’s great about the designs, and what the librarians would do differently next time, and lunch will be provided. Of course, we can’t do this without your help. We simply ask that you to put the Your Voice, Your Library survey button on your home page and encourage library patrons and staff members to take the survey. It takes about five minutes to complete. We will be sending information and the survey to you in advance through van delivery and on the PubDir and AllRegions listservs. Posted on August 18, 2017 April 5, 2019 Author Matt PerryCategories ConstructionLeave a comment on Your Voice, Your Library! Congratulations to all the applicants in the Massachusetts Public Library Construction Program (MPLCP) 2016-17 Construction Grant Round. On July 13, the MBLC approved a total of $66,905,603 for provisional construction grant awards to nine libraries in the grant round. At the same time a new construction waiting list was established of libraries slated to receive provisional construction grant awards as funds become available through the program’s annual capital budget. For a list of libraries approved for provisional awards and placement on the waiting list, visit our website via the link at the end of this post. It often takes years, or sometimes decades, to plan, design, fund and construct a new library building or complete an addition/renovation on an existing one. We know from experience that it is never too early to start the process. For more information about the program, please visit the MBLC’s website: http://mblc.state.ma.us/programs-and-support/construction. For the last few weeks I have been spending part of my time with OCLC and WebJunction, helping with a IMLS-funded course. Small Libraries Create Smart Spaces is a program that is supporting 15 small and rural public libraries from across the country as they reimagine and reconfigure their libraries into smart spaces. Most are looking at creating “active learning” spaces from underused or newly reclaimed space (from weeding collections, for example) in their existing libraries. My particular role has been as a champion of Design Thinking – I was brought on board to help with the Ideation and Prototyping modules. 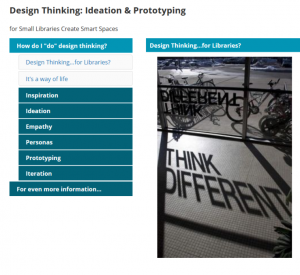 These concepts are two of the components outlined in the Design Thinking for Libraries toolkit by IDEO. It’s an approach I’ve been teaching and using in my work for a couple of years. The course is completely online, so talking about physical space and especially building prototypes was a bit of a challenge! However, with lots of help from the amazing Betha Gutsche and Brianna Hoffman of OCLC and some pretty amazing tech tools, we made it work. We even had real-time sessions for brainstorming ideas and creating personas. One of the things I love about my job is the opportunity to share my passion about library design and new ways of thinking and working. It’s especially fun to expand the reach of the agency beyond the borders of Massachusetts and share these ideas with a larger audience. None of this would have been possible even ten years ago. Online collaboration tools are way beyond what they were, and they make it fun. One of the great little-known resources for librarians in the commonwealth is the MBLC’s professional collection. 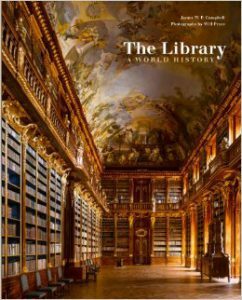 We have hundreds of books on just about every conceivable library-related topic. All these items are available via the NOBLE network. 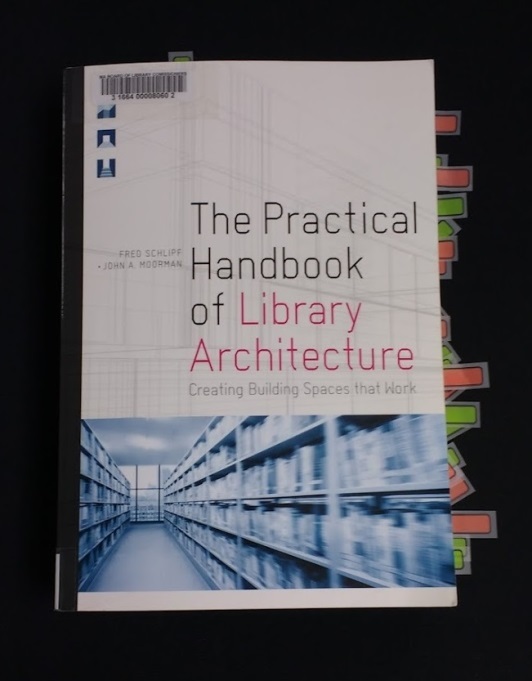 Because of our current construction grant round, we have put together a resource guide with a list of some of the newest books in our collection in the area of library design, construction and maintenance. Each item on the list links directly to the record in NOBLE, to make requesting easy.